Established in 1579, Lithuania’s Vilnius University is among Europe’s oldest universities. It is also one of a very small number where the historic campus remains largely intact. This makes it a wonderful place to explore. One obvious place to begin exploring the historic campus of Vilnius University is Littera bookstore. Not because there is a lot of must-have tourist information available at Littera (this is a campus bookstore with popular literature in Lithuanian, scientific books, books authored by university faculty, and university souvenirs), but because it creates an immediate connection to the university’s past. Littera bookstore itself is rather small, and dark wood and rows of books make it feel even smaller. It is cozy. Or rather, Littera would be cozy if not for the jumble of figures floating just overhead. Although the vaulted ceilings are not themselves very large, the frescoes that fill them expand the room outward, upward, and into the past. Lithuanian artist Antanas Kmieliauskas created Littera’s sprawling frescoes in 1978 for the 400th anniversary of the founding of Vilnius University. His work was part of a larger project intended to use the university’s interior spaces – which were no longer in their original form – to reflect the university’s history. In Littera, Kmieliauskas created a series of scenes representing the university’s historic areas of study, which include astronomy, medicine, botany, music, and art. Each scene includes symbols of the discipline depicted, an allegorical figure, and what seem to be stylized representations of actual professors and students – all of which appear to be slowly drifting toward the top of the vaulted ceiling. Kmieliauskas also “hung” portraits of famous university professors, alumni, and patrons along the bottom of the arches that support the ceiling. It’s a lot to take in. But then, there has been a university here for a very long time. The frescoes Antanas Kmieliauskas created for Littera are just one of works created by various artists to celebrate the 400th anniversary of Vilnius University. Just next door and up the stairs, Aisciai Hall features “The Seasons” by Petras Repšys. (Although these are also frescoes, they are very different in style.) There are also two halls with frescoes included in the university library tour (advance registration required). Other areas with frescoes are not open to the public. The historic Vilnius University campus is located in the old town area of Vilnius, Lithuania. The campus grounds and buildings are open to visitors on a limited basis. (A portion of the campus and a few buildings are open during certain hours.) There is a small charge to enter the grounds. There is an additional charge to take in the view from the campanile of St. John’s Church, which is only open between April and October. Tours of the historic library are also available for a small charge and must be booked in advance. Vilnius University is a popular tourist destination in the heavily-touristed old town. Expect crowds whenever you visit, especially in small spaces like Littera. And, while you are there, take the time to buy a souvenir in Littera as an extra thank you for sharing this space with the public. See the Vilnius University Museum and the Go Vilnius websites for information on visiting Vilnius University. Take a virtual tour of the university’s historic buildings using an interactive graphic of the Vilnius University Architectural Ensemble. 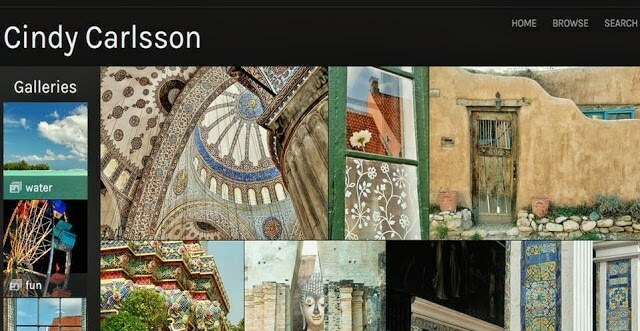 Take a 360 tour of Littera at Kosto Šukevičiaus’ panorama page. I’ve heard about this bookstore and I am planning to visit it when I go to Lithuania. It looks really beautiful. I did a lot of research about Vilnius as I was supposed to go there last summer. The plan fell through because I decided to go to Riga instead. Time was two short for both Latvia and Lithuania. Great pictures, like always. You’ll really enjoy Vilnius – lots of great architecture. We tried to do both Latvia and Lithuania and Latvia really got shortchanged; you made a good decision to focus on just one. But Lithuania is wonderful, we spent a bit of time in Vilnius, along the Curonian Spit, and places in between. We really enjoyed our time there and recommend it! 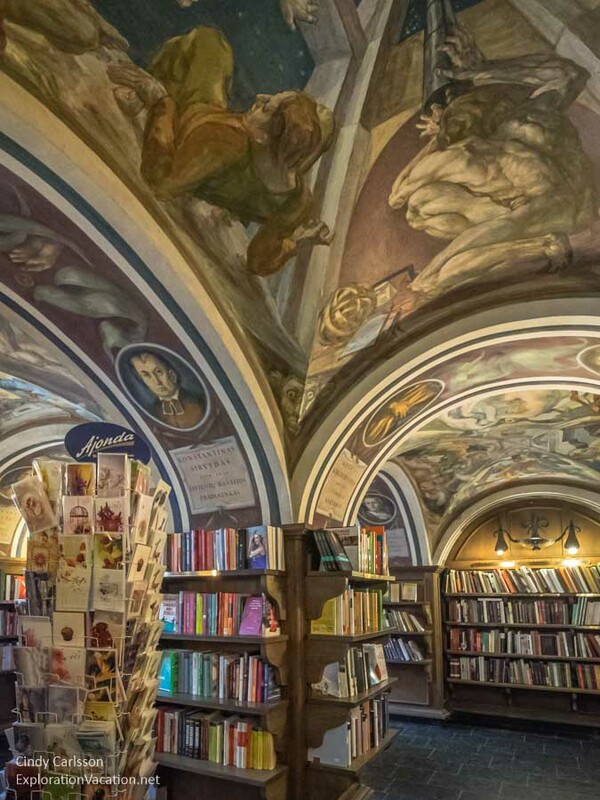 I love bookstores anyway, but those frescoes really make it gorgeous. I’d love to spend an afternoon curled up on those giant pillows, assuming they have some books in English to read! It would be a wonderful place to read – when it isn’t filled with gawking tourists. (Although there were a few people in there reading and somehow ignoring all of us!) They do have a few English language books and some illustrated books, so you could find something to get lost in.